A "LAMP" stack is a group of open source software that is typically installed together to enable a server to host dynamic websites and web apps. This term is actually an acronym which represents the Linux operating system, with the Apache web server. The site data is stored in a MariaDB database, and dynamic content is processed by PHP. In this guide, we will install a LAMP stack on a Debian 9 server. In order to complete this tutorial, you will need to have a Debian 9 server with a non-root sudo-enabled user account and a basic firewall. 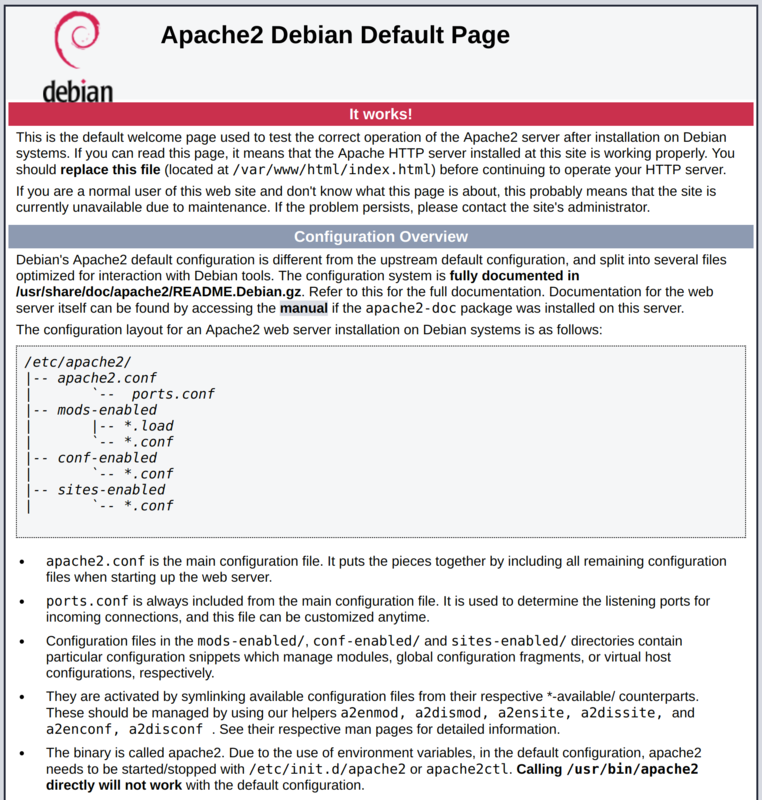 This can be configured using our initial server setup guide for Debian 9. The Apache web server is among the most popular web servers in the world. It's well-documented and has been in wide use for much of the history of the web, which makes it a great default choice for hosting a website. Since this is a sudo command, these operations are executed with root privileges. It will ask you for your regular user's password to verify your intentions. Once you've entered your password, apt will tell you which packages it plans to install and how much extra disk space they'll take up. Press Y and hit ENTER to continue, and the installation will proceed. Next, assuming that you have followed the initial server setup instructions by installing and enabling the UFW firewall, make sure that your firewall allows HTTP and HTTPS traffic. sudo ufw app info "WWW Full"
If you see this page, then your web server is now correctly installed and accessible through your firewall. If you do not know what your server's public IP address is, there are a number of ways you can find it. Usually, this is the address you use to connect to your server through SSH. This will give you two or three lines back. They are all correct addresses, but your computer may only be able to use one of them, so feel free to try each one. Regardless of the method you use to get your IP address, type it into your web browser's address bar to view the default Apache page. Now that you have your web server up and running, it is time to install MariaDB. MariaDB is a database management system. Basically, it will organize and provide access to databases where your site can store information. MariaDB is a community-built fork of MySQL. In Debian 9, the default MySQL server is MariaDB 10.1, and the mysql-server package, which is normally used to install MySQL, is a transitional package that will actually install MariaDB. However, it’s recommended that you install MariaDB using the program’s actual package, mariadb-server. Note: In this case, you do not have to run sudo apt update prior to the command. This is because you recently ran it in the commands above to install Apache, and the package index on your computer should already be up-to-date. This command, too, will show you a list of the packages that will be installed, along with the amount of disk space they'll take up. Enter Y to continue. This will take you through a series of prompts where you can make some changes to your MariaDB installation’s security options. The first prompt will ask you to enter the current database root password. This is an administrative account in MariaDB that has increased privileges. Think of it as being similar to the root account for the server itself (although the one you are configuring now is a MariaDB-specific account). Because you just installed MariaDB and haven’t made any configuration changes yet, this password will be blank, so just press ENTER at the prompt. The next prompt asks you whether you'd like to set up a database root password. Type N and then press ENTER. In Debian, the root account for MariaDB is tied closely to automated system maintenance, so we should not change the configured authentication methods for that account. Doing so would make it possible for a package update to break the database system by removing access to the administrative account. Later, we will cover how to optionally set up an additional administrative account for password access if socket authentication is not appropriate for your use case. From there, you can press Y and then ENTER to accept the defaults for all the subsequent questions. This will remove some anonymous users and the test database, disable remote root logins, and load these new rules so that MariaDB immediately respects the changes you have made. In new installs on Debian systems, the root MariaDB user is set to authenticate using the unix_socket plugin by default rather than with a password. This allows for some greater security and usability in many cases, but it can also complicate things when you need to allow an external program (e.g., phpMyAdmin) administrative rights. Because the server uses the root account for tasks like log rotation and starting and stopping the server, it is best not to change the root account's authentication details. Changing the account credentials in the /etc/mysql/debian.cnf may work initially, but package updates could potentially overwrite those changes. Instead of modifying the root account, the package maintainers recommend creating a separate administrative account if you need to set up password-based access. At this point, your database system is set up and you can move on to installing PHP, the final component of the LAMP stack. PHP is the component of your setup that will process code to display dynamic content. It can run scripts, connect to your MariaDB databases to get information, and hand the processed content over to your web server to display. In most cases, you will want to modify the way that Apache serves files when a directory is requested. Currently, if a user requests a directory from the server, Apache will first look for a file called index.html. We want to tell the web server to prefer PHP files over others, so make Apache look for an index.php file first. When you are finished, save and close the file by pressing CTRL+X. Confirm the save by typing Y and then hit ENTER to verify the file save location. Use the arrow keys to scroll up and down, and press Q to quit. If, after researching, you decide you would like to install a package, you can do so by using the apt install command like you have been doing for the other software. At this point, your LAMP stack is installed and configured. Before making any more changes or deploying an application, though, it would be helpful to proactively test out your PHP configuration in case there are any issues that should be addressed. In order to test that your system is configured properly for PHP, create a very basic PHP script called info.php. In order for Apache to find this file and serve it correctly, it must be saved to a very specific directory called the web root. Now you can test whether your web server is able to correctly display content generated by this PHP script. To try this out, visit this page in your web browser. You'll need your server's public IP address again. 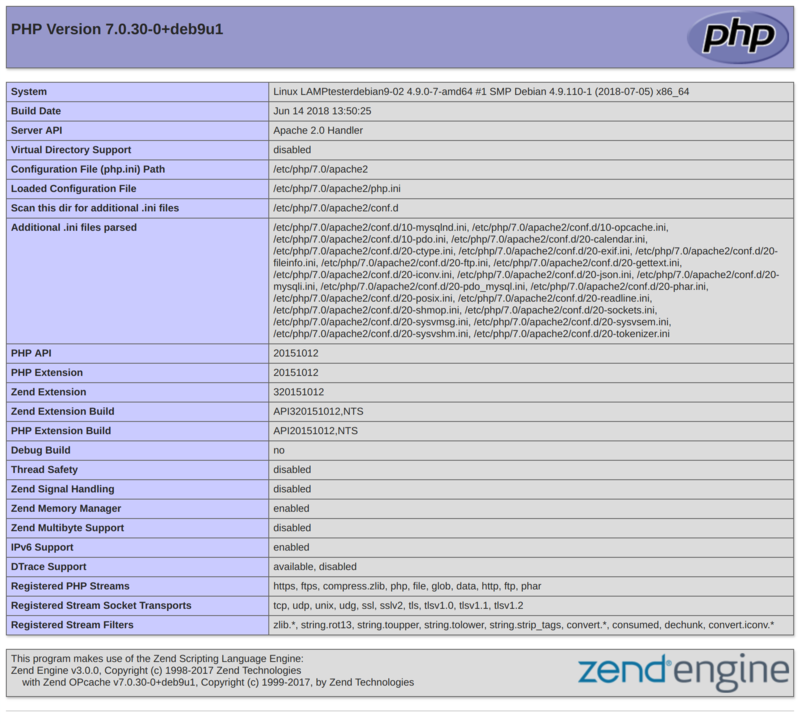 This page provides some basic information about your server from the perspective of PHP. It is useful for debugging and to ensure that your settings are being applied correctly. If you can see this page in your browser, then your PHP is working as expected. Now that you have a LAMP stack installed, you have many choices for what to do next. Basically, you've installed a platform that will allow you to install most kinds of websites and web software on your server.